Figure 1. 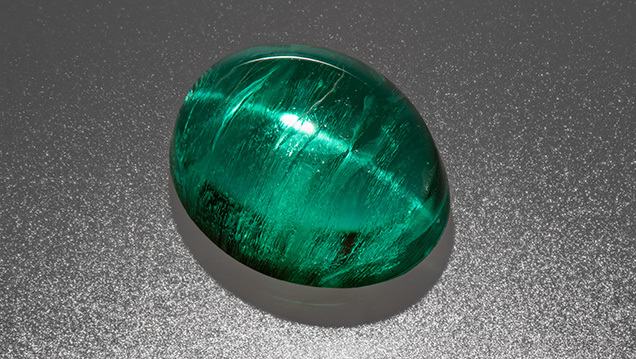 This 2.73 ct Gilson synthetic emerald cabochon displays a sharp “cat’s-eye” phenomenon. Photo by Kevin Schumacher. In the early 1960s, French ceramist and engineer Pierre Gilson succeeded in growing and producing flux synthetic emerald of commercially marketable quality. By the mid-1970s, it was reported that Gilson commanded 95% of the world market in synthetic emeralds (J. Sinkankas, Emerald and Other Beryls, Chilton Book Company, Radnor, Pennsylvania, 1981, p. 308). While the Gilson factory is no longer active, the material is still occasionally encountered in the trade and in gemological laboratories. The authors recently examined one example, a 2.73 ct cabochon that was of particular interest for its chatoyancy (figure 1). Gilson synthetics are often grown from seed plates of slices of natural beryl positioned parallel to the c-axis. Micro­scopic examination of the specimen revealed veils and wispy secondary flux fingerprint inclusions, as well as strain bands like graining aligned parallel to the c-axis, all common features of Gilson synthetic emerald. The numerous growth striae resulted from inner strain, caused by periodic growth interruptions or slight changes in chemical composition when the growth tank was recharged (Sinkankas, 1981; R. Diehl, “Neues zum Thema ‘Synthetischer Smaragd’: Besuch bei Pierre Gilson,” Zeitschrift der Deutschen Gemmologischen Gesellschaft, Vol. 26, No. 2, 1977, pp. 61–75). Figure 2. The parallel arrangement of a network of primary flux inclusions is responsible for the cat’s-eye effect. Photomicrograph by Jonathan Muyal; field of view 2.77 mm. Also parallel to the c-axis (the basal pinacoid of the original crystal), we observed a plane of tubes (figure 2) that was responsible for the chatoyant effect. This plane of numerous elongated bubbles/cavities containing the primary flux—and possibly minute phenakite crystals—was located near the base of the cabochon. This oriented plane of primary flux tubes also appears to result from the variation of conditions during growth. The micro-world of flux-grown Gilson emerald has already been captured extensively (E.J. Gübelin and J.I. Koivula, Photoatlas of Inclusions in Gemstones, Vol. 3, Opinio Publishers, Basel, Switzerland, 2008). But the interest of this specimen is its clever fashioning, with the plane of the coarse primary flux residue—which a lapidary would normally want to remove—oriented close to the base and parallel to it, turning this into a chatoyant specimen. In fact, this is the first time a Gilson flux-grown cat’s-eye emerald has been encountered by the authors. Jonathan Muyal is a research stone collection gemologist at GIA in Carlsbad, California, and Pierre-Yves Chatagnier is with Tsara International in Paris.